Barilleaux, Ryan J. and Kelley, Christopher S.. 2010a. “What Is the Unitary Executive?” In The Unitary Executive and the Modern Presidency, ed. Barilleaux, Ryan J. and Kelley, Christopher S., 1–16. College Station: Texas A&M University Press. Barilleaux, Ryan J. and Kelley, Christopher S.. 2010b. “Going Forward: The Unitary Executive, Presidential Power, and the Twenty-First–Century Presidency.” In The Unitary Executive and the Modern Presidency, ed. Barilleaux, Ryan J. and Kelley, Christopher S., 219–30. College Station: Texas A&M University Press. Benson, Guy. 2014. “Obama Slams Bush for Expanding Executive Power, Ignoring Congress.” Townhall.com, February 13. Available at http://townhall.com/tipsheet/guybenson/2014/02/13/pure-gold-obama-slams-bush-for-expanding-executive-power-ignoring-congress-n1794535. Accessed January 5, 2016. Bickel, Alexander. 1974. “Watergate and the Legal Order.” Commentary, January 1: 19–25. Buchanan, Bruce. 1978. The Presidential Experience. Englewood Cliffs, NJ: Prentice-Hall. “BuzzFeed News Exclusive Interview with the President.” 2016. Available at www.youtube.com/watch?v=WVqZ269kUr8. Accessed May 18, 2016. “Dear Colleague Letter: Transgender Students.” 2016. US Department of Justice, Civil Rights Division, and US Department of Education, Office for Civil Rights, May 13. Available at www.ed.gov/ocr/letters/colleague-201605-title-ix-transgender.pdf. Accessed May 18, 2016. Farley, Robert. 2014. “Obama’s Immigration Amnesia.” FactCheck.org, November 18. Available at www.factcheck.org/2014/11/obamas-immigration-amnesia. Accessed April 18, 2016. Genovese, Michael and Morgan, Iwan W.. 2012. Watergate Remembered: The Legacy for American Politics. New York: Palgrave Macmillan. Karl, Jonathan. 2014. “Obama’s Long-Lost Campaign Promise.” Abcnews.go.com, February 17. Available at http://abcnews.go.com/blogs/politics/2014/02/obamas-long-lost-campaign-promise. Accessed April 19, 2016. Kelley, Christopher S., Cook Marlowe, Melanie, and Barilleaux, Ryan J.. 2011. 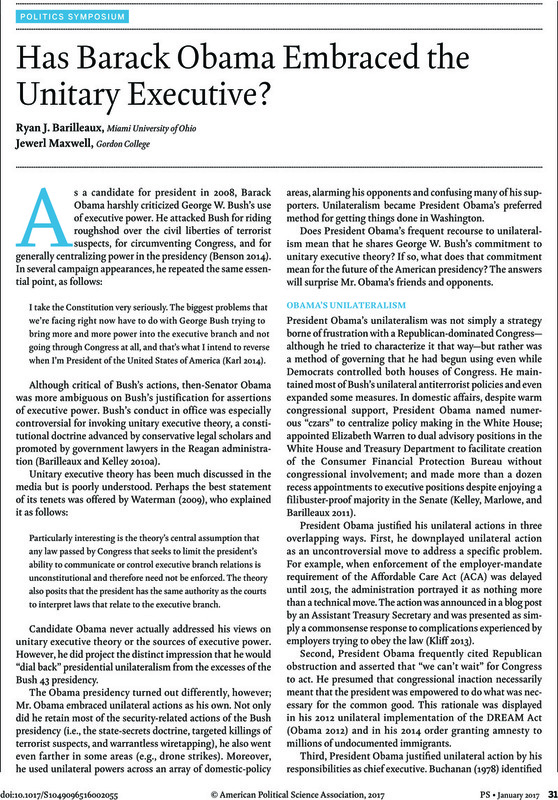 “President Barack Obama: Unilateralist.” In The Obama Presidency: Change and Continuity, ed. Dowdle, Andrew J., Van Raemdonck, Dirk C., and Maranto, Robert, 77–90. New York: Routledge. Kessler, Glenn. 2014. “Obama’s Royal Flip-Flop on Using Executive Action on Illegal Immigration.” Washington Post, November 18. Available at www.washingtonpost.com/blogs/fact-checker/wp/2014/11/18/obamas-flip-flop-on-using-executive-action-on-illegal-immigration. Accessed January 6, 2016. Kliff, Sarah. 2013. “White House Delays Employer Mandate Requirement until 2015.” Washington Post, July 2. Available at www.washingtonpost.com/blogs/wonkblog/wp/2013/07/02/white-house-delays-employer-mandate-requirement-until-2015. Accessed January 5, 2016. Korte, Gregory. 2014. “Obama Issues ‘Executive Orders by Another Name.’” USA Today, December 17. http://www.usatoday.com/story/news/politics/2014/12/16/obama-presidential-memoranda-executive-orders/20191805/. Accessed September 15, 2016. Krent, Harold. 2008. “From a Unitary to a Unilateral Presidency.” Boston University Law Review 88: 523–59. Lovelace, Ryan. 2015. “Hillary Clinton: I Would ‘Go Further’ than Obama on Immigration.” Washington Examiner, May 15. Available at www.washingtonexaminer.com/hillary-clinton-i-would-go-even-further-than-obama-on-immigration/article/2564050. Accessed February 3, 2016. Martin, Graham G. and Super, David A.. 2007. “Judicial Deference to Administrative Agencies and Its Limits.” Clearinghouse Review March–April: 596–609. NLRB v. Noel Canning . 2014. 573 U.S. ____. https://www.supremecourt.gov/opinions/13pdf/12-1281_mc8p.pdf. Accessed September 15, 2016. Obama, Barack. 2012. “Remarks on Immigration Reform and an Exchange with Reporters.” June 15. Gerhard Peters and John T. Wooley, The American Presidency Project. Available at www.presidency.ucsb.edu/ws/?pid=100991. Accessed January 5, 2016. “Richard Nixon Interview with David Frost Transcription.” 2016. Lybio.net. Available at http://lybio.net/tag/richard-nixon-interview-with-david-frost-transcription. Accessed February 10, 2016. Simendinger, Alexis. 2016. “Obama Picks Up Pace of Executive Actions.” RealClearPolitics. May 26. http://www.realclearpolitics.com/articles/2016/05/26/obama_picks_up_pace _of_executive_actions_130671.html. Accessed May 27, 2016. Sollenberger, Mitchell A. and Rozell, Mark J.. 2012. The President’s Czars. Lawrence: University Press of Kansas. Waterman, Richard. 2009. “The Administrative Presidency, Unilateral Power, and the Unitary Executive Theory.” Presidential Studies Quarterly 39 (2): 5–9.